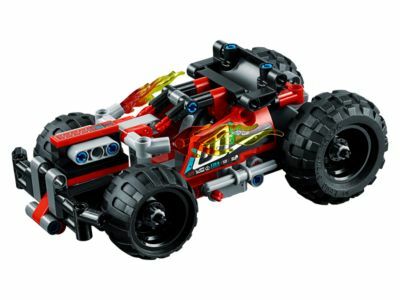 Power up the rugged LEGO® Technic BASH!, featuring an awesome red, black and gray color scheme with cool racing stickers, heavy-duty front bumper, large rear spoiler and huge chunky tires. Activate the powerful pull-back motor to experience this vehicle's amazing power and acceleration, and see the engine crash out of the car body on impact… BASH! Price is 26% below the initial Lego retail price, a € 5.25 discount! This comes down to 10.60 cent per brick. LEGO Technic - 42073 BUMMS! LEGO® Technic 42073 Tout flamme ! The BASH! (42073) Lego set is available from the sites below. However, they do not offer delivery to your selected region. The BASH! (42073) Lego set is no longer directly available from the sites below. However, 3rd party partners of these sites might still have the set available. Alternate description Get ready for high-speed action and impacts with the BASH! Check out the red, black and gray color scheme with cool racing stickers. New-for-December-2017. See the engine fly out of the vehicle body on impact. Combine with the 42072 WHACK! to create an awesome WHACK! ‘N’ BASH! combi model with 2 pop-out engines! BASH! measures over 2” (7cm) high, 6” (17cm) long and 3” (9cm) wide. Combi model WHACK! ‘N' BASH! measures over 3” (9cm) high, 7” (20cm) long and 3” (10cm) wide.